The decals are produced by Protocraft. The company focuses on O scale products but has a number of HO and S scale decal sets. Rick Leach created the artwork that includes a few SP subsidiary reporting marks as well as data lettering for the as-built cars and lettering that follows post-1930 practices. This was just what I needed to get an interesting freight car into the Wheeling Freight Terminal fleet. 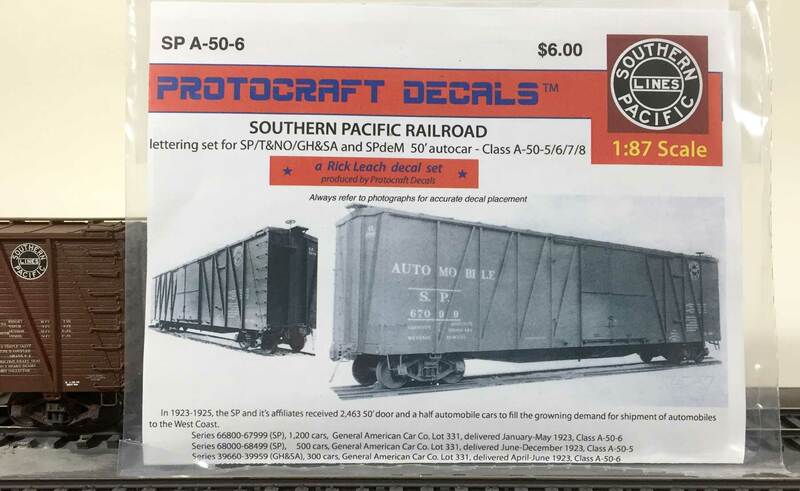 The Protocraft decal set covers SP car classes A-50-5 through A-50-8, but I am uncertain if the F&C kit reflects proper details for the A-50-7 and A-50-8 cars. The Southern Pacific installed 2000 of these 50-foot cars in 1923. The model was assembled quickly in late January. I decided to build it as an A-50-5 class with an end loading door. After some service time, the model was prepped for the paint booth by cleaning it with Shout stain remover and a soft-bristled toothbrush as per the kit instructions. Once the model was dry, it went to the paint booth for a mineral brown finish. The base color is Vallejo burnt umber with six to eight drops of Vallejo Model Air aged white added to lighten the color. After the paint was dry, the model was sprayed with Pledge Floor Care Multi Surface Finish for the gloss coat. This product is the rebranded Future acrylic floor finish. The gloss coat was not thinned. While the gloss coat dries the car number, build date, reweigh date, and reweigh location data were determined. This data was jotted down on a piece of scrap paper and kept for reference at the workbench. Once the gloss coat dries the specific decals are carefully cut from the sheet. Decals are applied to the ends first then the work focuses on one car side. After the decals are applied to both sides of the car and dry the model goes back to the paint booth for a second gloss coat to seal the work. I think a second gloss coat makes the decal film disappear onto the model. After the second gloss coat dries, a flat coat is applied. I used to apply the flat coat from a spray can but have recently changed my method. 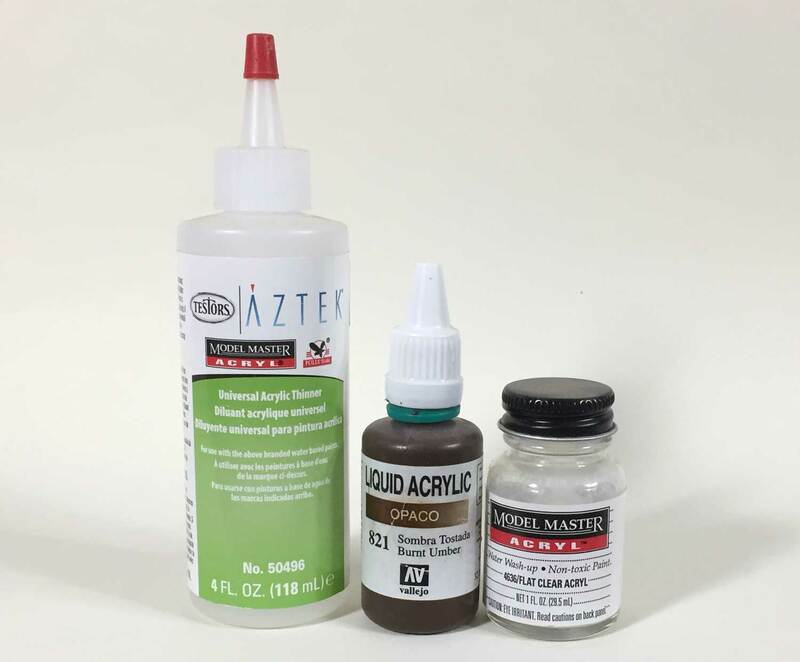 Model Master 4636 flat clear acryl is now used with an airbrush. I add a little Model Master Universal Acrylic Thinner for an easy application. A few models ago, I started to add a few drops of the car color and a drop or two of light grey or aged white to the clear flat. This needs to be mixed well before spraying it onto the model. This tinted flat coat now gives the original finish a faded or chalky appearance. It also cuts the brightness of the lettering. In the past, I would rely on the first weathering wash to fade the finish but now the tinted flat coat eliminates the need for a wash for some models. These prototypes were built in 1923, so they wouldn’t be too grimy by my November 1926 modeling focus. This SP automobile box car is ready for a few weathering layers but it will see some layout service first. It is surprising to compare this model with others in the fleet. As you see above, the SP car is huge when compared to a 36-foot Canadian Pacific box car. The size difference reflects the progress of car design through the Teens. The CP prototype was originally built in 1905, nearly two decades before the SP prototypes came into service. Excellent article – thanks for introducing me to another Decal maker. This makes me want to get out those F&C auto boxes that I’ve had in the queue for too long. I like the idea of adding a drop or two of the car color to the flat overspray. Just getting caught up on your latest blogs and move—hope that goes well. Nothing stretches out the soul than a move! Re your suggestion about putting a drop or two of car color in the flat I have a sense that the folks who make that stuff in rattle cans, have done the same. I sprayed some Model Master onto a clear piece of glass which after two weeks, started to look a bit gauzy. This was done in the DC area in winter so the house was quite dry. Another nice read Eric. It really is rather eye opening how things changed between 1900 and 1960, with rapid advancements nearly every decade in many things. The steam engines grew from rather small to huge, automobile became common, atomic power came to be. Diesel locomotives came to be the next great thing. The roaring 20s really were roaring that is for sure. Just a few blocks away from your freight station the mills were really cranking out the products. I always like to see your entries on your railroad and the models that are on it. It always brings back good memories. I have just finished building the wooden Northeast Scale Models version of this car. The kit comes with decals and is a close match for the A50-6 T&NO#58401 in the NMRA freight car book. Unfortunately the photo is in B&W (of course), so I’m anxious to establish the correct body colour prior to painting. What examples I have managed to find, apart from yours, suggest a Mineral Red which is closer to Oxide Red than the brown shade of Box Car Red you have used. Do you know whether the paint shade was altered during the 1946 -8 repaint period ?